Elizabeth Jingle is a Jaru woman. She was born in the bush out near Halls Creek. Her ancestors are from the country around Warmun. 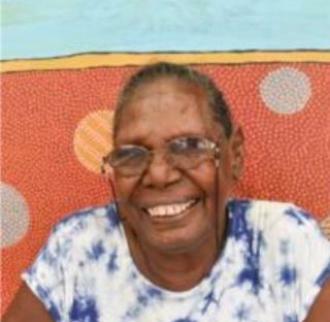 Her parents lived and walked between Halls Creek and Lamboo Station, 50 kms from Halls Creek. As a little girl at Lamboo Sta on she milked goats and worked in the kitchen, washing dishes and mopping floors. She went to school at Halls Creek. At age 11, along with her two sisters and brother, she went with her parents to Fossil Downs Station. They worked in domestic jobs around the station for the Macdonald family. Elizabeth met her husband, a Gooniyandi and Bunuba man, at Fossil Downs Station. She named her daughter after Maxine Macdonald from Fossil Downs. In 1976 They moved to Fitzroy Crossing and in 1980 when the Junjuwa Community was completed they moved there and have lived there since. Elizabeth started painting at the old Mangkaja Art Centre when it was at the IGA site around 2000 with the then Manager Karen Dayman. She Paints stories that her parents and ancestors have told about dreamtime, law and culture. How they travelled and lived, hunted and survived.